What's better than sacrificing a piece in the opening, to take your opponent into unknown territory, and increase your chances to score early in the game? Coach Dan Heisman presents a new video series to teach you how to use the sacrifice weapon to stun your opponent! What's better than sacrificing a piece in the opening, to take your opponent into unknown territory, and increase your chances to score early in the game? Coach Dan Heisman presents a new video series to teach you how to use the sacrifice weapon to stun your opponent. In the Two Knights defense, one of the most used openings at Club level, Black defends 4.Ng5 with 4. …Be5?!. How many times you have found yourself wondering what to do after the imminent Knight fork in f7? Precise play leads to equality, but any minor slip can provoke an unbalanced game, full of tactics, with Black having the best chances to take the whole point home. In this first video, with his calm and amazingly easy-to-follow style, Coach Heisman guides us through the subtleties of the piece sacrifice 5. … Bxf2+, with the white King accepting the Bishop sacrifice, to then move to e3 after Black’s Knight captures in e4 with a check. In this video, after accepting the Bishop sacrifice, the King moves to g1 instead of e3 when it’s checked by the black Knight in e4. In the previous videos, coach Heisman showed us that after the Black King moves to e3, Black has a few options to at least equalize the game. Now the question is: what should Black play here? The answer is Qh4!. Check out the video for all the interesting possibilities that Black gets in this peculiar position. In this video Coach Heisman teaches us how to use an ancient weapon, that a Club level is still a powerful way to impress your opponent and gain some advantage by sacrificing a Knight in f3. The Kings Gambit is one of the oldest studied chess openings. It was examined in the 17th century by the Italian Giulio Cesare Polerio. After 300 years of successes, during which the opening generated great games, including the Immortal, in recent years the King Gambit has seen some decline in its usage, but it still remains a great opening to learn and to use as an almost “secret” weapon. After the canonic moves, Coach Heisman guides us through the old line 3. … g5 with Black ensuring White can’t get back the pawn, which leads to the piece sacrifice in f3: What if White opts for saving the Knight and, instead of playing 0-0 he plays the rare line Ke5 after Black’s g4? Coach Heisman shows us how Black, in such a case, can easily get an almost immediate advantage. After Black accepts the Knight’s sac, White compensates the piece loss with a huge development advantage. But, of course, the way to victory is still littered with tricks, traps, and tactics. Watch Video 3 to learn how to deal with this old but still perfectly usable variation of the King’s Gambit! Again, it’s easy to see how white gets compensation for the sac with a huge advantage in development. In video 4 Coach Heisman shows us the main line and some of the most common sidelines that this gambit position generates. In video 5 we’ll see what sacrificing the Knight on the b5 pawn leads to. When your opponent plays such a daring move, you’re almost always forced to take, accepting the sac. Coach Heisman empathizes this concept, showing us why declining the sac leads to problematic position for Black. So, after Black takes the Knight, an interesting and very tactical series of variants rise and studying those you’ll improve your level of play, and win more games in the Sicilian Sveshnikov. Here White sac the Bishop on b5, instead of the Knight. This way to sac a piece in the opening seems to be more sound than the previous one, and Coach Heisman goes through all the main possible development of such a challenging position. Coach Heisman published an article on Chess Life Magazine, about the Lolli Gambit revived, having found an improvement of the Fried Liver (or Fegatello, in its original Italian form). In this video, Heisman explains how the Lolli can be a super-tactical and important weapon in your arsenal, in a widely used opening at club level: the Two Knights defense. After the opening sequence 8.Nxf7! If now 8. …Kxf8, then 9.Qf3 wins. This opening can really throw off your opponent, who is probably expecting you to play the Fried Liver, and facing this “novelty” can find it pretty hard to avoid the premature disaster! Obviously, Black isn’t forced to take the pawn in e4 at move 6, but Coach Heisman shows you the lines that spring from the Lolli’s 6.d4?! Watch video 7, and stun your opponent with a little-known tactical opening. This opening is a well-known piece of chess theory, but it still is useful to know, when your opponent makes a notorious mistake, after the opening moves. In the previous video, we’ve seen that the best move for Black is now 5. …Na5, with equality. If Black captures with the Knight in d5, White enters the “Fegatello” or Fried Liver Attack, with a Knight Sacrifice. White forces Black to accept the sac, since the fork doesn’t allow Black to decline the offer in any good way. After King takes Knight in f7, Qf3+ and Black is already in trouble. Of course, Black is not lost, but his game is not easy, and accurate play by White will increase the pressure and make Black uncomfortable. Watch Video 8 to learn all the tricks to make this Opening another weapon in your arsenal. You don’t have to wait for October to watch this video! Coach Heisman explains the nuisances of a rare gambit, which is a quite speculative opening, not very common and, for that very reason, it can become another arrow in your quiver! In this first video on the Halloween Gambit, Coach Heisman shows us what happens when Black moves the Knight in g6. Play must be really precise, or Black will find himself in trouble. If Black knows how to play this gambit, the game is not lost at all, but his play needs accuracy and precision. After the opening move sequence we’ve seen in the previous video, Black decides to play 5. …Nc6. And now White has to push around those black Knights, to get compensation for the sacrifice. Again, White can win the game right away, unless Black knows how to approach the unbalanced position that arises after the sacrifice in the opening. Watch Videos 9 and 10 to see how Coach Heisman goes through all the main variations, make this opening yours and use it to stun your opponents! So far Coach Heisman has covered, in this fantastic series, openings that start with 1.e4. It’s time to give the 1.d4 players some love, too! Let’s start with the Bronstein’s piece sacrifice in one of the most used openings for 1.d4 players: the Queen’s Indian, Saemisch variation. Coach Heisman always tries to give you off-beat lines to study, so that you can use them to surprise your opponent. This one is not so off-beat, yet it’s not seen every day on the board. Here is the move sequence which leads to a stunning Queen sac. Now White must stop the Knight fork! In this video, Coach Heisman analyzes for us what happens after White’s move 12.Ke2. Now Black saves the Knight by taking the pawn in c4, and from there three different main lines are playable. Watch Video 11 to learn how to deal with such a particular position! In this video, after the opening moves sequence we’ve seen in the previous video, Coach Dan Heisman shows us the new developments that this Queen sac has had in the latest years, with the help of the massively strong chess engines. In the past, 12.Ke2 was the only played move in this situation. Nowadays, computers have shown that there are at least two other moves that can lead White to get a good game. The first move that Dan analyzes in this video is 12.Kf2. This gives Black a chance to support the Knight in e3 and get his dark-squared Bishop into play, with 12. …Bh3. It’s a Computer line, but nowadays it’s so important to know the lines suggested by the silicones! Check out Video 12 and enjoy Dan’s clear style. To conclude this fantastic journey, Coach Dan Heisman presents us with two videos on the Alekhine Defense. This super-famous opening, which starts with the moves 1.e4 Nf6, sees Black tempting White's pawns forward to form a broad pawn center, with plans to undermine and attack the white structure later in the spirit of hypermodern defense. White's imposing mass of pawns in the center often includes pawns on c4, d4, e5, and f4. Using the words of GM Nick De Firmian to describe the Alekhine defense: "The game immediately loses any sense of symmetry or balance, which makes the opening a good choice for aggressive fighting players." In the first video on the Alekhine Defense, Dan uses the beginning of a famous game, played by Mikhail Tal and Bent Larsen, in the 1965 Candidate Matches. It was a highly psychological battle, with Larsen being very provocative after the first few moves. In the position, normally Black plays Bg4 or g6. But Larsen, knowing he was playing the most “adventurous” man in chess at the moment, came up with a very daring couple of moves: 4. …dxe5 and after 5.Nxe5, he dropped the bomb: 5. … Nd7. He was clearly inviting and tempting Tal to sacrifice his Knight in f7! But Tal knew it was a very important game and, after thinking deeply about his next move, he ended up playing 6.Bc4. What would have happened if White sacrificed the Knight on f7? Today’s tremendous engines help us understand all the tricks and tactics that such a move would lead to. In this first video, after a few forced moves that come from the Knight’s sac, Dan Heisman shows that Black finds himself in dire straits, having to move his Knight away from being captured by a pawn. The two videos analyze the different lines that come up from 10. …Nb6 and 10. …Nb6. This time it’s not like the Halloween Gambit though: one of the moves leads to Black losing almost immediately, the other one is less crushing, but poses a lot of problem to Black. After all, Tal should have followed his killer instinct, and sac the Knight in f7! What's better than sacrificing a piece in the opening, to take your opponent into unknown territory, and increase your chances to score early in the game? Coach Dan Heisman presents a new video series to teach you how to use the sacrifice weapon to stun your opponent! In this fantastic series, Coach Heisman tackles some of the openings that allow piece sacrifices. Most of the openings Dan chose are not main-stream, which makes them arrows in your quiver, ready to be shot at your opponent! For any of these openings, Coach Dan explains the main themes and then analyzes for you the possible piece sacrifice. 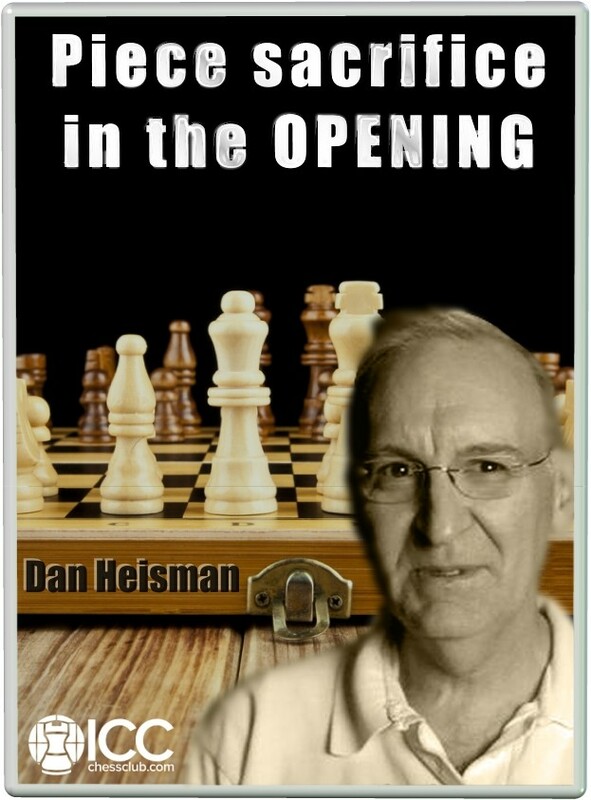 A clear, formative, easy-to-follow, not-to-be-missed video series from the acclaimed coach Dan Heisman!